We’re back again for the third instalment of this series, where I delve into the data collected by the PFF analysts in order to find a fantasy edge. Whether it’s a player’s SKCon or their TPOP metrics, we have a wealth of information at our disposal here at ProFootballFocus to leverage. One of my favorite PFF metrics when it comes to identifying undiscovered fantasy potential has to be tackle per opportunity, more commonly known around here as TPOP. As for what it is, it’s exactly what it sounds it should be – an indicator of how regularly a player makes a tackle when a play is in their vicinity — also known as how much of a nose for the ball does said player have. 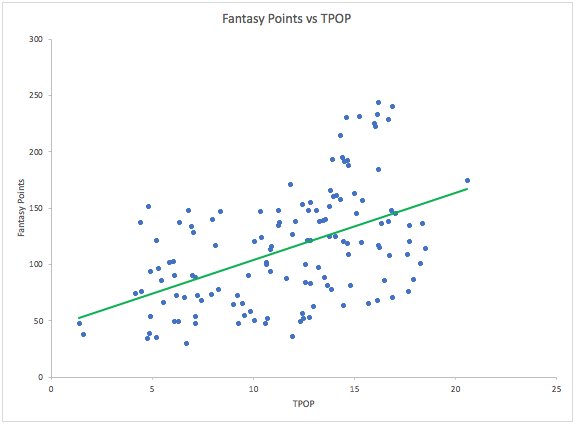 Furthermore, there is a direct positive correlation between TPOP and a player’s fantasy production – the better a player’s TPOP, the higher their chance to be a high-scoring fantasy linebacker.